Despite these similarities, relationship of Nepal, Pakistan and Bangladesh with India cannot be said to be cordial. Sri Lanka which too is very close to India also has troubled relation with it. One of the lessons to be drawn from the said facts is that proximity of geography, language and culture are immaterial in bilateral relations between the two nations. This is also borne out by the fact that there exist an excellent and outstanding relations between Israel and USA,UK and USA, Cuba & former USSR which are and were not only poles apart geographically but also have/had different culture and religions. It is therefore, not geography or culture, but outlook and vision or attitude of a given nation/s that shape the relationship between any two nations or among the nations. The perpetual enmity between south and North Korea is one more example of how the geographical or other proximity can even play a negative role to shape the relations between the nations. If we are really serious to improve the relation with India, first and foremost task for us is that we must put aside the clichéd and sweet talk of geographical or cultural proximity which is the real issues between Nepal and India under the carpet. We must be ready to face the hard facts and act accordingly if we are keen on bringing the relationship between two countries to normal level. We must without mincing the words boldly oppose and refute in free and frank manner any argument, view, action or deed which belittles our sovereignty, from wherever it emerges. Each perception should be wherever it emerges. Each perception should be opposed vehemently which sees our country as a backyard of India or butter between India and China. We are neither a buffer state nor a ‘backyard’ of any country. The existing approach to treat our country as the geographical and cultural extension of India or any other nation in the name of shared culture or religion should be opposed. Nepal is a landlocked country. In other words it is India locked (padlocked by India!). India holds the ‘key’ of Nepal. The past and the present series of events drive home the fact that New Delhi has always treated Nepal as its colony. Indian ruling circle right from Nehru and his colleagues to Team Modi has the same unchanged viewpoint about Nepal which visualises Nepal as an extension of India. Although formally every member at the helm of affairs in New Delhi states that Nepal is a sovereign country, they also swear that Nepal is competent enough to decide its own course. They even claim that they are against the intervention in Nepal’s affair. Nevertheless, in practice, it is an open secret that the India House in Kathmandu and Delhi ensure their major role in Nepal’s major as well as minor affairs. Whether one likes or not, the word ‘micromanagement’ is synonymous with Indian intervention in Nepal. Unless India renounces its colonial mindset and shun its present role of patron and big brother in Nepal and looks at Nepal as a friend and a partner of equal stature for peace and the mutual prosperity of each country the present unequal and strained relations cannot be changed. The time is ripe for India to dump the baggage of history and demonstrate magnanimity commensurate with its size, power and position in world affairs. To normalise the relations between the two nations India as its first priority should take initiative and provide unqualified and uninterrupted access to nearest sea. The ‘Key’ of India-locked Nepal should be handed over to Nepal as per international laws and treaties. The wrong notion within the ruling circles in Delhi that if not controlled Nepal would tilt toward China is only an illusion. There is no need for Nepal whatsoever to ‘tilt’ toward one country or the other. Also, the policy makers in Nepal must understand that the country stands on its own in spite of seeking patronage from other countries. The fact is that both India and China are important indispensable neighbours for Nepal. Nepal is geographically or otherwise located in such a position that going closer to one neighbour at the cost of other is suicidal for the country. The policy of maintaining equal distance or equal proximity to both the southern and northern neighbour is the best foreign policy for Nepal. The sooner the rulers in Delhi and Kathmandu recognise this and act accordingly, the better it is. This will help normalise the present sour relations. One of the prominent Nepali scholars is correct to write that the British Government kept the Nepal-India border open primarily for two purposes. The first was to maintain unrestricted migration of the Nepalese hill people to India and to procure them for recruitment in the Indian army. Recruitment of the Nepalese in the British army was very difficult up to the period of Prime Minister Ranodip Singh, because the Government of Nepal was in principle against the recruitment of its people in a foreign army. The clandestine and secret operations adopted by the British to get Nepal hill people in the Indian army were disliked by the Nepalese government which took strong measures to discourage the practice. Some of the Gorkhas serving in the Indian army on their return home on leave were even put to death and the property of those serving the Indian army was confiscated. Sensing the harassment meted to families of the Gorkhas in the Indian army by the Nepalese government and to make the recruitment easier, the British Government encouraged migration of the Gorkhas from Nepal with their families and established Gorkha settlements in the hills of India, such as Bhagsu, Bakloh, Almora , Darjeeling, Deharadun, Shillong, etc. It was only during the period of Prime Minister Bir Shumsher that the Nepalese government freely allowed enlistment of Nepalese in the Indian army. The second important factor for maintaining open border by the British was to have easy and free access of British and Indian manufactured goods into Nepal as well as to Tibet wherein Nepal was the only easy and accessible route from India before the discovery of Chumbi Valley route from Sikkim. Moreover, the British wanted to have secure and easy supply of raw materials from Nepal into India such as timber and forest produce, herbs and medicinal plants, hides and skins, etc. There is not any written document or proof maintaining that the border between the two nations would remain open. The open border system by and large came into existence particularly in fifties. The Treaty of 1950 provides for free movement of people to each other’s countries as well as allows the citizen of both nations to participate in trade and commerce. However the result is that while an Indian national with his large capital and expertise establishes business house or Industry in Nepal and he is recognized as a successful businessman or industrialist in Kathmandu but his Nepali counterpart with no capital and skill ends up as a waiter or a domestic servant in Delhi. The open border has served twin objectives for India: that of facilitating free access of Indian people and goods to Nepal on one hand so as to keep Nepal under perpetual Indian dominance and control and secondly, keeping a check on ‘Chinese activities’. On the other hand the autocratic Nepali rulers of that period too wanted to wash their hands of the unemployed youth population of Nepal. It was easy for them to send their youths to India for jobs than to face their ire. Besides, Nepal was not in a position to dictate its term in the said Treaty. If Nepal is to become an independent and sovereign nation in the world and wants to safeguard its economic interest besides sovereignty and territorial integrity it must regulate the open border regime and adopt passport and visa system between India and Nepal. The argument that open border has facilitated and strengthened the social and cultural ties between the two countries may not be wrong but sovereignty and security of any nation is always above everything else. The treaty signed between India and Nepal touted as cornerstone in bilateral relation by some was neither a natural outcome of friendly relations nor an epitome of friendship between Nepal and India. It was signed by the last Rana Prime Minister Mohan Shamsher under duress. By signing the treaty proposed by India he was hopeful that Nehru would provide support to prevent the downfall of Rana regime. Mohan Shamsher was equally afraid of communist takeover by China. For Nehru the treaty was a legal tool to place Nepal within Anglo-Indian axis and to prevent Nepal from going to the fold of USSR-China axis. Broadly speaking, the treaty was the outcome of cold war between contemporary capitalist and socialist camp. In south Asian context the treaty was meant to bring Nepal under India’s fold as a geographical and cultural extension of India. The clauses laid down in the treaty and letter of exchange and underlying message therein is clear that Nepal despite being a sovereign nation should remain under Indian sphere of influence. Further, the main theme of the treaty which is nowhere divulged is: matters related to its foreign affair, defense issues and natural resources should be decided by India. Another most important but undefined objective of the treaty is to keep the border open between the two countries so that unrestricted flow of man and trade material to Nepal could be ensured. More than that, the open border has further strengthened the viewpoint that Nepal shares ‘special relationship’ with India. It was, therefore, a psychological victory for India and moral defeat for Nepal. Nepal is paying the price of same mistake of keeping the borders open with India right from the period of fifties to present days when thousands of ‘agitators’ were pelting stones and hurling petrol bombs from Indian side of ‘no man’s land’ in the name of Mahesh movement . The treaty of 1950 titled as Peace & Friendship Treaty of 1950 consists 10 clauses. Going by these clauses except article 2, 5, 6 & 7 nothing objectionable content could be found in other articles. The former two articles are related to mutual consultation in case of troubled relations with the neighbours and import of arms and ammunition only through India. Both of these articles are highly objectionable and undermine the sovereignty of Nepal. It is noteworthy here that India refused to renew trade and transit treaty and resorted to embargo against Nepal in 1989 because the then king Birendra had imported weapons from China against the wishes of India. The latter two articles are concerned with providing ‘national treatment’ to the citizens of both countries and according priority to Indian citizens in Nepal’s trade and commerce, economic activities and free movement of people and goods etc. This clause puts hugely unequal Nepal and India at equal footing and hence is against the national interest of Nepal, a far weaker and smaller country than India. Secondly, it gives monopoly to India over Nepal’s trade, commerce and natural resources. If the treaty of 1950 is somewhat vague in many respect the letter of exchange which was made public after 10 years is more categorical on many Issue as to what India wants from Nepal. The Letter of exchange has clearly laid down that neither Government shall tolerate any threat to the security of the other by a foreign aggressor. To deal with any such threat, the two Governments shall consult with each other and devise effective countermeasures. It speaks categorically to forge a kind of military alliance with India. Furthermore, defense material required to Nepal is to be imported from or through India with the consent and approval of India. Nepal should not employ any foreigner in its service. The Indian should get priority in contracts. Finally Delhi let the proverbial cat come out of the bag. Thus, the Letter of Exchange had exposed the whole design of Delhi. Neither Nehru nor King Tribhuvan are alive today. But the trends and tendencies of Nehruvian era not only refuse to die down but stand as the biggest obstacle on the way of cordial relations between the two sovereign nations. Still the ruling circle in Delhi and Indian embedded media makes hue and cry when a head of the government of Nepal visits China. Moreover, Delhi makes it sure that the maiden visit of any head of the government of Nepal should not be to China but to India. Many myths have been weaved around Nepal-India relation and it has been consistently fed up that how India is walking extra mile to help Nepal. It is also said that millions of Nepali citizens are getting employment in India and Indian has helped Nepal hugely in development and prosperity. Rather the fact is that Nepal’s economy has become heavily dependent on India. Nepal has incurred a huge trade deficit with India. Nepal is still one of the poorest nations on earth. Industries are almost non-existent. Around two third of its workforce has left the country in search of employment. The country is reeling in darkness up to eighteen hours each day due to the lack of electricity. Once an exporter of agriculture products, Nepal primarily an agriculture country, is now a big importer of grains and other edible items. It is therefore not correct to say that India has helped Nepal in the field of economy and development. The other much hyped notion that millions of Nepali people are getting employment is another fact that does not match with reality. At the most, there are 5 to 7 lakh Nepali citizens working in India. The data randomly provided by Indian writers and policy makers is not based on any concrete ground or documented proof. * It is neither geography, nor culture or religion that shapes the relation between Nepal and India. * Leadership of both the nations must be ready to face hard facts that stand on way of friendly relation between the two nations. * India should shun its colonial mindset of looking Nepal as extension of India/sphere of influence. * India should provide unqualified and hassle free transit and access to the Indian and/or Bangladesh port through India. 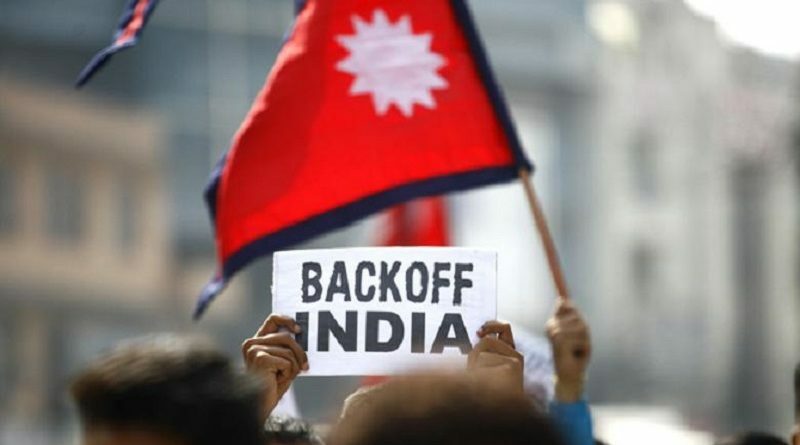 * India should desist from intervening in Nepal’s affairs, internal or external in real sense of the word and shun the policy of ‘as long as you accept our terms we shall not intervene in your affairs. * The open borders between two nations should be closed. * The treaty of 1950 be abrogated. ← Advance indigenous peoples’ struggle for self-determination!